Designed in cargo, window and cutaway van, and chassis cab configurations with cues from the celebrated Fiat Ducato, our automaker's flagship commercial work vehicle's back for 2019, and we at Mann Chrysler Dodge Jeep Ram of Mt Sterling can already see how it's punching in early ahead of the competition. 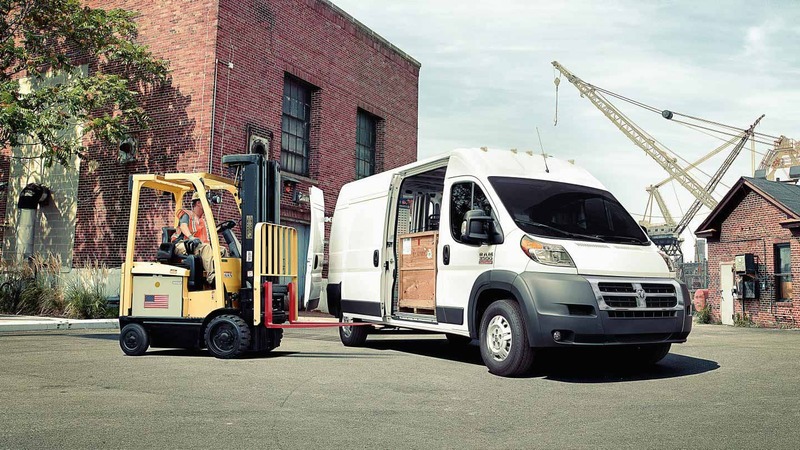 After all, the new RAM ProMaster represents a tradition of being expertly customizable to meet a variety of professional and personal needs, whether as a delivery van, work truck, or even an RV conversion. Check out what it can bring to your workday, right here! Best-in-class horsepower, for one, should help you make quick work of the grind. RAM ProMaster can put out 280 via 3.6-liter Pentastar® V6, not to mention that it can shell up to 260 pound-feet of torque. Paired with a standard 62TE six-speed automatic transmission, you can count on shifts to remain as smooth as the ride is capable. On that note, the van can manage a tight 36-foot turning diameter between curbs, meaning more maneuverability where space is limited, such as down urban streets, through alleys, and around loading docks. Factor in that it can lug payloads up to 4,860 pounds and offers a towing capacity up to 5,100 pounds, and that upcoming duty roster becomes a done deal. Of course, you'll also want longevity, and a long 10,000-mile interval between oil changes all but ensures it. Moreover, rear and three-piece modular front fascia make the van easy to service while keeping maintenance costs low. That's performance you can depend on for the long haul. RAM ProMaster is also the safe bet for the nine-to-five, and that owes to more than just its extensive front airbag network and the balance and stability afforded by its class-exclusive front-wheel drive system. Technologies like electronic stability control, all-speed traction control, hill start assist, and trailer sway control come together with four-wheel disc anti-lock brakes to provide dependable handling and stopping power. That peace of mind extends even to sliding into place at your destination, as a ParkView® rear backup camera comes standard and a ParkSense® rear park assistance system is available to ease the process. The ProMaster cabin is nothing if not both accommodating for a fellow day-laborer and configurable for a boatload of cargo. Optional 180-degree swiveling front seats, for one, make managing the hold a snap from the cockpit, and a versatile cargo space it is, you'll find. The van's standard, medium, long, and extended wheelbases deliver anywhere from 8 to 13 feet of length, and when you consider the low 21-inch load floor height, best-in-class 66.3-inch cargo height and 75.6-inch cargo width, and a huge cargo capacity up to 460 cubic feet, you'll see just how adaptable it is. Nearly 90-degree-vertical walls and 17 floor and sidewall tie-downs make storing and accessing tons of tools and equipment a breeze. You can even access your quarry from both the side and the rear: the van's back doors swing open 260 degrees, open 60 inches, offer detents at 90 and 180 degrees, and can fold almost entirely flat against the exterior. Bring optional dual sliding side doors that can open up to 49 inches into the mix, and you'll find meeting flexible loading requirements is even easier. 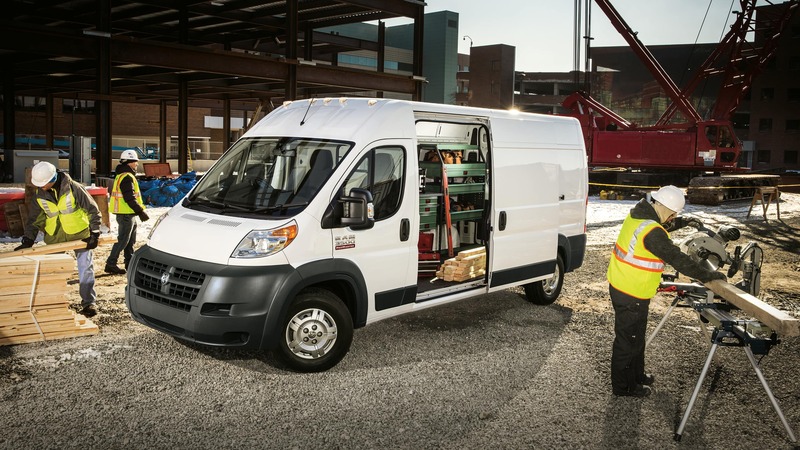 The bottom line: a capable mobile office and a new RAM ProMaster are practically synonymous. It shows in a host of smart systems at your disposal. Front and center for staying connected on every job is an available 5-inch Uconnect® 3 NAV infotainment system. It features both voice command for ease of use and Bluetooth for wireless audio streaming and hands-free calling. Navigation is optional for finding your way between clients, and SiriusXM support comes available to keep you connected to both traffic and weather updates and your favorite programming along the way. There's even more to check off your list of work van needs under the hood and in-cabin, and you can check out all that of our automaker has to offer right here at 806 Alexa Drive. Call us or visit us in person today to schedule some time behind the wheel and a personal tour from one of our friendly sales personnel.